Nobody has ever complained at home about eating broccoli or cauliflower or any kind of vegetable. My daughter eats all kind of veggies since she was a baby and teaching her palate has enabled her to enjoy so many dishes. To avoid getting into trouble with them or listening to their complaints and getting annoyed, I always made macaroni when a friend of my daughter came for lunch. I’m not their mom and it’s not my business to teach them to eat properly. But today’s recipe is not a macaroni’s one, it’s a new broccoli one I found in a magazine and thought… why not? let’s give my boring steamed broccoli a hot twist! And I tell you that it was a wonderful idea! Flax seeds contain high levels of lignans and Omega-3 fatty acids. Lignans may benefit the heart, possess anti-cancer properties and studies performed on mice found reduced growth in specific types of tumors. Initial studies suggest that flaxseed taken in the diet may benefit individuals with certain types of breast and prostate cancers. Flax may also lessen the severity of diabetes by stabilizing blood-sugar levels. There is some support for the use of flax seed as a laxative due to its dietary fiber content though excessive consumption without liquid can result in intestinal blockage. Consuming large amounts of flax seed can impair the effectiveness of certain oral medications, due to its fiber content. 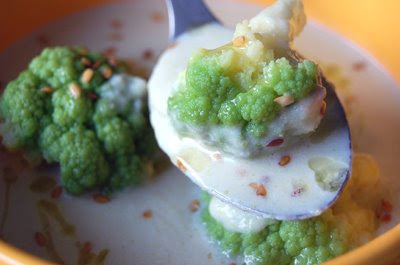 Ingredients for 4 servings: 1 broccoli, 1 medium/big onion, 1 glass of cream (nata líquida), 1 spoontable of flax seeds, 1 garlic clove, olive oil, black ground pepper and salt. Ingredients for the special oil: half a glass of olive oil, 1 red hot pepper, 2 drops of tabasco and a pinch of oregano. Prepare the oil for the dressing: half glass of olive oil, add the red hot pepper, the tabasco drops and the oregano and wait for two days until you use it. Clean and wash your broccoli and save a couple or 3 small bunches to decorate the plate. Mince the onion and garlic. Pour some olive oil in a pot, enough to cover its surface and add the onion, stir and cook at low heat for 5 minutes and add the garlic. When fragrant add the broccoli and cover with 1 liter of water. Cook for 35 minutes or until the broccoli is tender. Use a food processor to blend the ingredients and when you get a fine puree add the cream, taste and add salt and pepper accordingly, cook for 5 more minutes and it’s done. Boil the bunches of broccoli you reserved in salty water for 8 minutes. 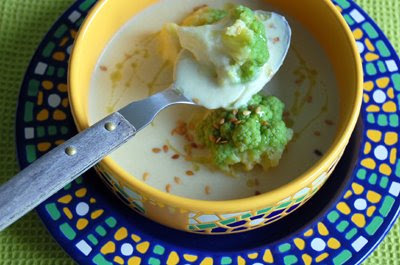 Prepare the plate with the soup, the broccoli bunches and the Lax seeds on top. Pour some of the hot spicy oil you prepared as a dressing. Cook it yourself and enjoy! You have now the first dish of the menu… would you like to try this as a second? 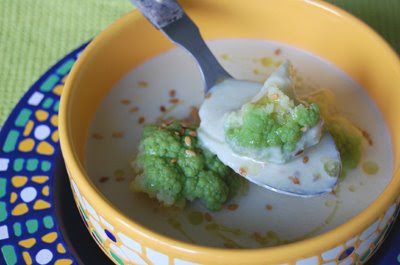 I often enjoy a good broccoli soup Nuria! This is a wonderful recipe with the flaxseed and the spiciness of the chilis. Also you can use flax seed to replace eggs in certain baked goods. By whisking 1 tablespoon of ground to a powder flaxseed with 2 tablespoons warm or hot water until it thickens it will serve as a binder. It won’t be good in everything but I’ve tried it in oatmeal cookies only because I ran out of eggs before so it’s my emergency replacement sometimes. Mmm, that sounds good. I love broccoli. The soup looks great! I think I will have to try this one. I trained my daughter’s palate as well. Since she was a baby we fed her all kind of nutritious things. We have continued in that for some time. I am sorry to report that she falls into that category of “yuck green stuff”! I could just cry! She is five. Maybe she will revert! Unfortunately my kids are like the friends of your daughter but I am sure they will appreciate them one day. Your soup sounds very original but I don’t know what flax seeds are so I will have to look it up. I remember the days when my daughters friends would be invited to lunch or dinner. I remember making homemade macaroni and cheese where the neighbours children were used to eating Kraft from a box. The gagging noises could be heard across the street…wink…wink…We are so lucky our children have seasoned palates to enjoy everything life has to offer Nuria!! I know what you mean about entertaining kids who are picky eaters. My daughter would always at least try everything and I am always amazed at parents who don’t even attempt to educate their kids! This soup would be a popular item in our house. We love everything with broccoli and it looks delicious! that’s a lovely soup for sure! simple but full of flavours. will try it out for sure. I love broccoli… and hot and spicy soup! Great combo! I’ve always loved broccoli and cauliflower. It’s soup season and I’m waiting for my bowl, por favor! Thanks Andy! 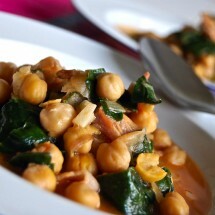 Welcome to Spanish Recipes :D. Hope you enjoy the rest and thanks for commenting. Hola Deeba :D. I’m sure your kids eat well… look at all your dishes!!! Hola Bloodsugar! Welcome to Spanish Recipes :D. Thanks for commenting. I’m sure your kids will learn one day Ivy. Just look at their mother ;D.
Val, I wish we could be neighbours!!!! Hola Susan :D… Still no artichokes on sight… can’t wait to cook your book’s recipe! Hola PG! Welcome to Spanish Recipes and thanks for your kind words. Hope you enjoy it! Then this is your house, Kittie! I have a hard time being patient with picky eaters, even if they’re kids. The soup sounds great to me, and great idea to use flax seed in soup. I only use flaxseeds in protein shakes, which is a shame. Thanks for this idea!